Ali Davis (Taraji P. Henson) is a successful sports agent who’s constantly boxed out by her male colleagues. When Ali is passed up for a well-deserved promotion, she questions what else she needs to do to succeed in a man’s world... until she gains the ability to hear men’s thoughts! With her newfound power, Ali looks to outsmart her colleagues as she races to sign the next basketball superstar, but the lengths she has to go to will put her relationship with her best friends and a potential new love interest (Aldis Hodge) to the test. 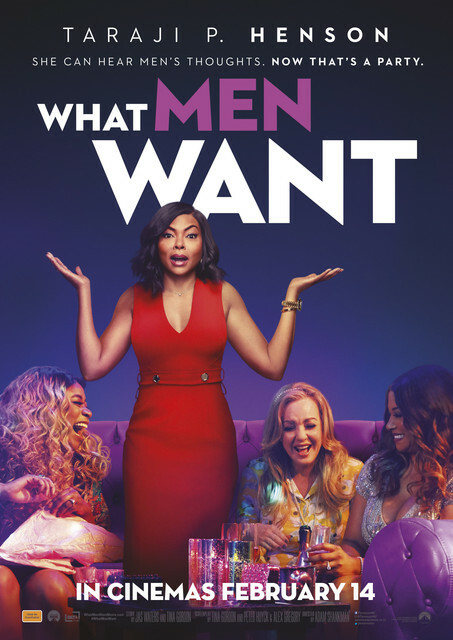 WHAT MEN WANT is the latest comedy from director Adam Shankman (HAIRSPRAY) and producers Will Packer and James Lopez (GIRLS TRIP), co-starring Tracy Morgan, Richard Roundtree, Wendi McLendon-Covey, Josh Brener, Tamala Jones, Phoebe Robinson, Max Greenfield, Jason Jones, Brian Bosworth, Chris Witaske and Erykah Badu. We've got 5 x doubles passes to give away. Executive Producers Taraji P. Henson, Amy Sayres, Adam Shankman, Matt Williams, David McFadzean, Dete Meserve Produced by Will Packer, p.g.a. , James Lopez, p.g.a.